Today I'm going to share a healthy and easy soup. One day my husband bought cabbage, carrots and beans from the market. All the veggies are so beautiful and fresh. He always prefers to buy different varieties of vegetables, greens and fruits from the wholesale markets. 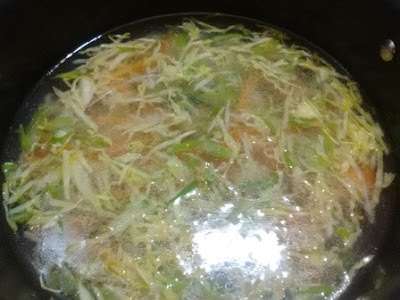 As soon as I saw the fresh, beautiful vegetables I decided to prepare a homemade veg clear soup. The soup was so tasty and refreshing. 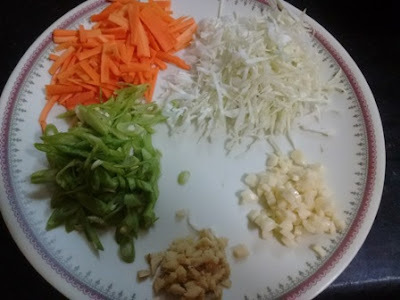 I like the crunchy vegetables in the soup and the fresh aromas from the finely chopped garlics and ginger was awesome. There is no need for any other additional flavours. 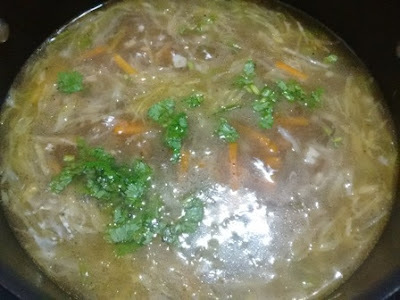 Finally garnishing the soup with fresh coriander leaves is a great flavour for this soup. Hope you give it a try. 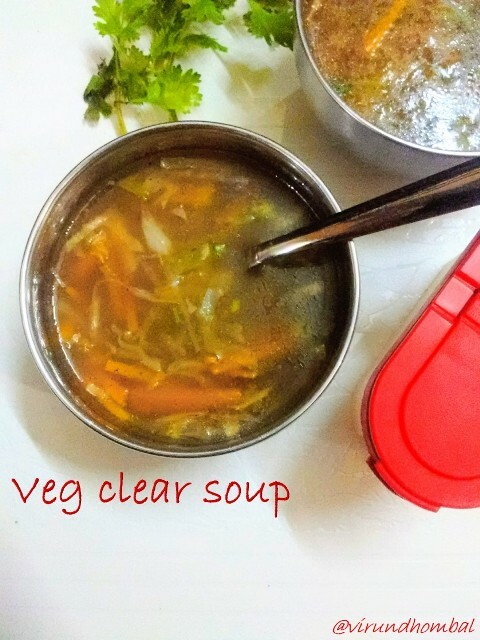 Vegetable clear soup is so easy and healthy with the combination of thinly sliced vegetables. Cut all the vegetables. 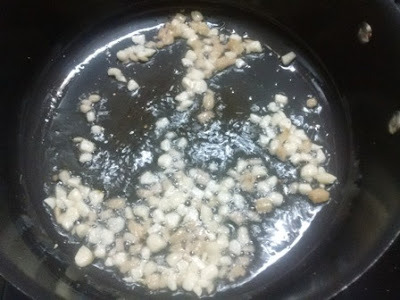 Heat oil in a deep vessel and add the garlic and ginger. Saute them well on low heat. Next add the carrots, beans. Stir and saute them for a few minutes. Now add the thinly sliced cabbages. Stir for a few seconds. Now add 2 cups of water. Allow them to boil for 4 minutes. Mix them well and add the required salt and pepper powder. In the meantime, dissolve the corn flour with 1/4 cup of water. Now add the corn flour water to the soup. When it boils well and the soup has started to thicken, add the lemon juice and chopped coriander leaves. Wash all the vegetables. Peel the carrots and cut them like a thin matchsticks. 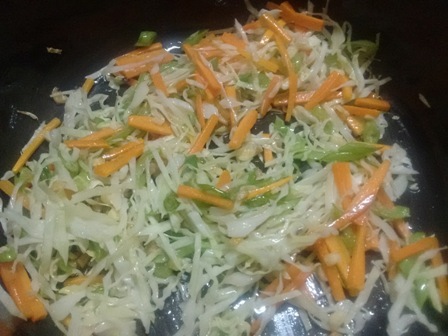 Slice the cabbages thinly with a sharp knife or slice them in the bajii blade in the carrot grater. Cut the beans, thinly. Chop the ginger and garlic finely. Heat oil in a deep vessel and add the garlic and ginger. Saute them well on low heat. (Do not brown them). 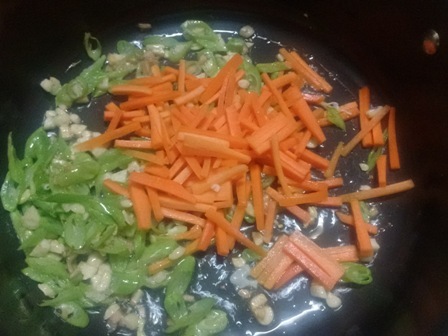 Next, add the beans and carrots. Saute them for a few minutes on a low flame. Add the thinly sliced cabbage. Stir them gently. Now add 2 cups of water. Allow them to boil for 5 minutes. No need to cook more than 5 minutes because the vegetables will lose its colour and texture in the soup. 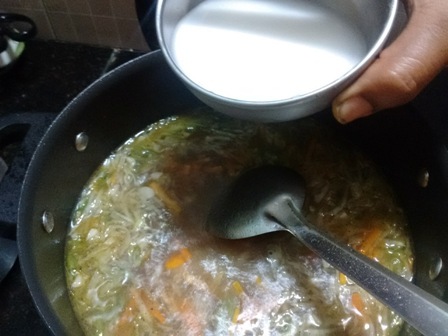 In the meantime, dissolve the corn flour with 1/4 cup of water. Add the required salt and pepper powder. 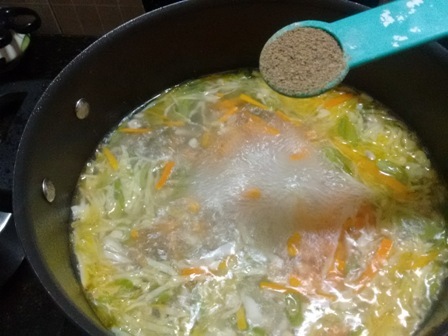 When it boils well and the soup has started to thicken, add the lemon juice and chopped coriander leaves. Turn off the heat. Mix them well and seve hot. 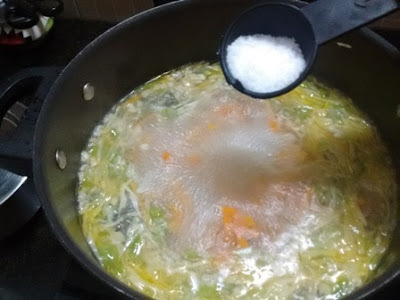 If you try this recipe for vegetable clear soup send us your comments below and share the recipe for your friends and family. Just made it - very very nice, thank you! Thanks a lot. Nice to see your feedback. Healthy and a comforting bowl of soup!